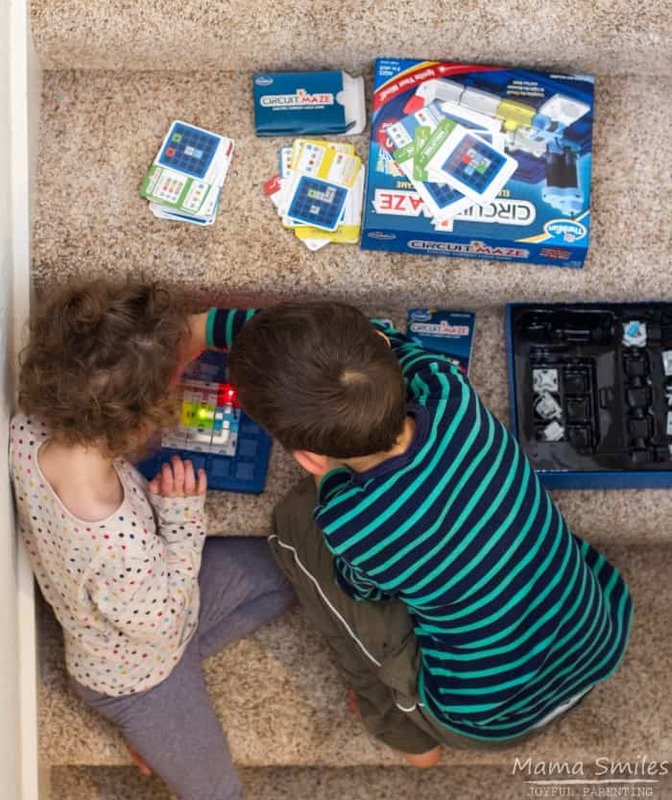 Circuit Maze taught my kids the basics of building circuits, as well as something much more important. Yet another reason STEM education is so important! 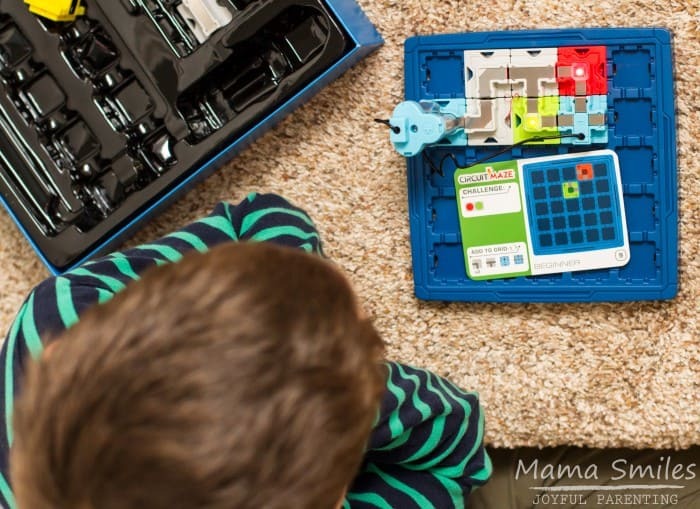 This past summer, Timberdoodle sent us a review copy of Circuit Maze – part of their 3rd grade Curriculum Kit. I pulled it out, and my eight-year-old third grader (Johnny) immediately gravitated towards it. Johnny LOVES single player games, and he is typically really good at them. Seven-year-old Lily and four-year-old Anna were also intrigued. With this game, you get a card showing where on the board to place a few pieces, as well as a few other pieces that you need to add to the board. To solve the challenge, you need to place the additional pieces in such a way that the circuit board lights up. Wherever possible, I let my children teach themselves. 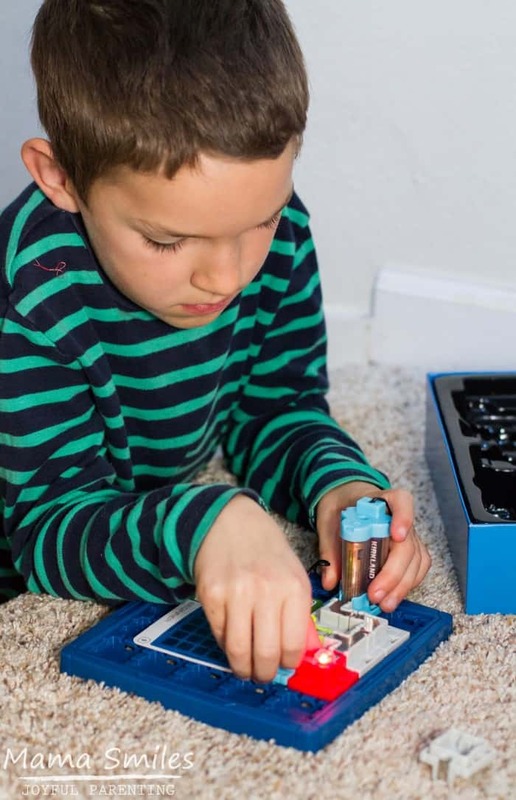 I showed the kids the basics of the game, and asked them to check their circuits with me before adding the battery pack, since it IS possible to short circuit this game and that would be sad. Then I went back to making dinner. I was, of course, keeping an eye on the kids from the kitchen. Each of the children – including ten-year-old Emma, who came over to find out what all the fuss was over – tried the game. Then each of them got frustrated. Four-year-old Anna and seven-year-old Lily started to use the cards to play an improvised version of “Go Fish”. I was disappointed that a brand-new game that seemed exciting was looking like a complete flop. Dinner was ready, and we sat down to eat. Then, I talked to my kids. They had each abandoned the game because they were frustrated. They were frustrated because they hadn’t read the rules, and they had refused to start with the beginner cards. Usually, my kids can start somewhere in the middle and do just fine with games like this. This time, they couldn’t. Circuits didn’t feel intuitive to them in the way that most problem-solving games feel intuitive. They didn’t understand how circuits worked. Together, we sat down and looked at the instructions for the game. I reminded them about what they already knew about circuits (this wasn’t our first circuits oriented game; just a different one). I showed them how to read the challenge cards (they had ignored the tips on which pieces to add). Most importantly, I made them step back to the beginner cards to build their skills, before moving on to the tougher challenges. It turns out, all three of my older kids do just fine with the beginner cards! As they build their skills they will work up to the tougher cards. 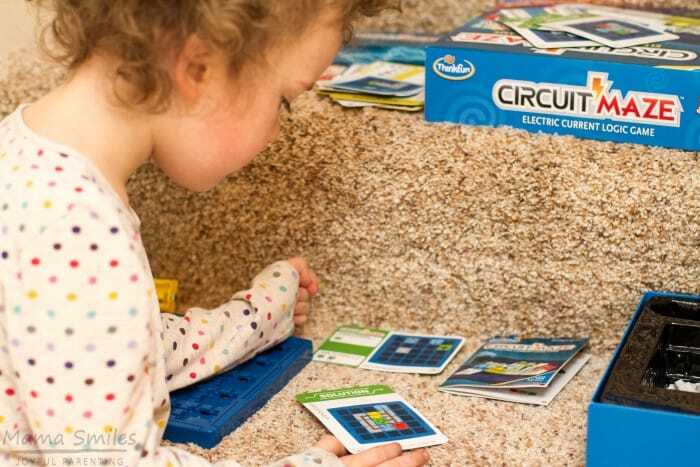 Four-year-old Anna is too young to figure out even beginner cards, so she got from help from her big brother. A growth mindset. They learned not to give up, just because the harder cards were too challenging. They can build up to that level, by starting at a level they understand. Resilience. Failing a task does not mean you give it up and move on to something else. Try approaching it from a different angle, or look for additional help. Perseverance. As frustrated as my kids were when they couldn’t get their circuits to work, they found it incredibly rewarding to see those lights shine. Mindfulness. When my children first started playing with this toy, they were focused ONLY on getting the lights to work. When that failed, they were upset. They were only able to succeed when they looked beyond the surface goal and paid attention to the purpose of the toy. 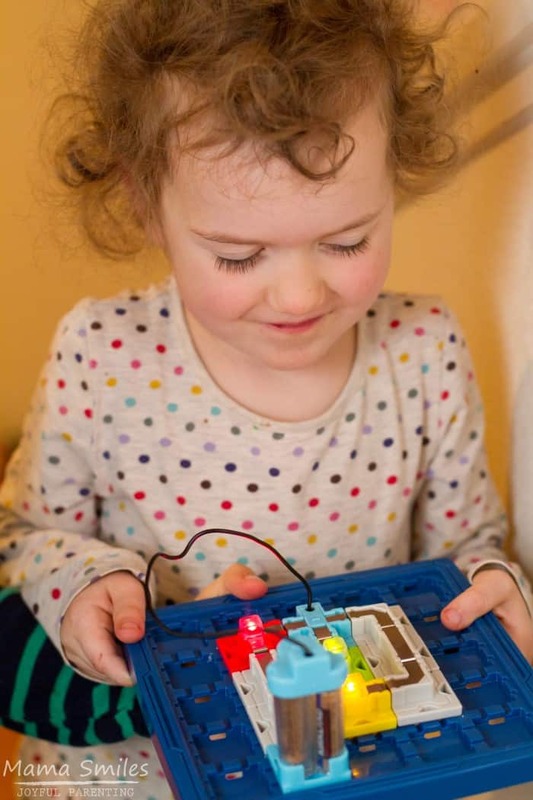 What do you see STEM themed toys teaching your children – beyond the basics of science, technology, engineering, and mathematics? I have kids that don’t read instructions also. So, I can totally see this scenario playing out in my house as well. Learning from failure is a great life lesson; even more important than STEM learning so I’m happy to see it paired up, even if unintentionally by the toy maker! Way to go for pushing through when it got difficult!